A simple horizontal dial with a pipe gnomon in a gravel bed, about 6 feet in diameter. Flush stone hour markers have raised Roman numerals. Unfortunately, several of the hour markers are incorrectly positioned, and moss and weeds partially obscure much of the dial face. Because of the presence of trees all around it, the dial only receives the sun in the middle of the day, and hardly at all in the winter half of the year. A plaque nearby explains that dial was installed to celebrate the opening of Burnaby Lake Park in 1977. A 12 inch octagonal stone horizontal dial with Roman hour numerals. Dial face depicts sun rays radiating from a central Beau Soleil to the hour numerals and outer time scale, which displays 5 minute graduations. This historic dial dates from the original Pendray House on the Havenwood, built in 1928. The dial was in poor condition and the gnomon was missing. 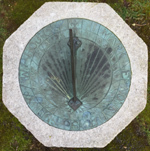 In July, 2009, NASS member Roger Bailey cleaned the dial, highlighted the markings and fabricated and installed a new brass gnomon. The property is now Essencia at Esquimalt Lagoon, a private resort community but with public access for community activities. A stone path and arch lead to the dial, nearly overshadowed by a large tulip tree. A 4 foot wide by 6 foot tall armillary dial of mild steel and blown glass. Dial is manually adjustable for standard or DST. Ecliptic ring includes zodiacal symbols. Dial base includes a 12 inch hemispherical time capsule to be opened October 14, 2015. A 10 inch square brass or bronze horizontal dial atop a 22 inch square concrete base with cross-shaped plinth 42 inches high. The natural patina developed by the corrosive sea air has reduced the contrast of the markings. Stylized Arabic hour numerals are engraved in circles. Engraved scrolls add interest but some confusion to the dial face. The dial face and gnomon are only one-eighth inch thick but remain intact. A lovely horizontal dial with an 8-foot high stainless steel gnomon. 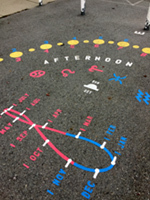 The hour lines are done as colorful alternating red and cream segments set in a 8-foot radius semi-circle. The gnomon is triangular in cross section with a single thin edge casting the shadow. The dial hour numbers are set for daylight, since all of the winery's 100,000 annual visitors are seasonal, coming when Pacific Daylight Time is in place. This analemmatic dial, called the Skaha Solar Timepiece is on a lakefront beach, spanning an area of 65 x 35 feet. At the center is a large 15 foot raised wooden platform supporting a flat steel analemma with months/dates pierced through. Observer stands on current date to be the gnomon. The hour markers are short concrete posts. These posts, which form an ellipse around the platform, were originally wood when the dial was first designed by Gwen Boyle a sculptor from Vancouver. After 14 years of weathering, the rotting wood was replaced by concrete during renovations in 1998. A 20 inch diameter brass equatorial dial with equatorial, meridian and equinoctial colure rings. Gnomon has two nodus balls that may show solar position at solstices. Equatorial ring has 15-minute marks and Arabic hour numerals. The dial alignment needs adjustment for its current location. A 10 inch diameter horizontal bronze dial with hour lines, quarter hour marks and Roman hour numerals. The dial face includes a central compass rose. The dial sits atop a fluted concrete pedestal. The dial is gnomonically correct, designed for latitude. A 30 inch diameter bronze equatorial dial. A slot in the rotatable gnomon project a line of sunlight onto the equatorial ring displaying Arabic hour numerals. Dial is corrected for longitude. Dial is mounted on a 53 inch high stone pedestal. This dial is also known as the George Cunningham Memorial Sundial as it was sponsored by the Cunningham Drug Stores to commemorate the opening of their first store in 1911 at a nearby corner. A large concrete and pebble horizontal dial with a 30 foot high gnomon. Hour lines are wood dividers in concrete with Roman numeral hour markers. Dial center and gnomon are situated in a lily pond. Dial is on private property but is fully visible from public street. This bright and colorful vertical dial declines west, showing "Hours to Sunset" (Italian hours). The dial is held up by two posts on a board 60 x 90 cm (24 x 36 inches). The dial face is decorated in the colours of the rainbow, with a band of color for each hour left to sunset. Quarter hours are marked using thin white lines. The dial was commercially printed on aluminum-plastic laminated material, with a UV protective coating. The gnomon is a repurposed decorative gate hinge. The supporting structure is made from red cedar. This is a 25 cm horizontal dial engraved on a 1/4 inch yellow metal plate (probably bronze). It shows local solar time. The hour marks look precise and consistent, but upon closer look are oddly arranged. The dialist attempted to shift the dial hour lines to correct for longitude (3.17 deg west). The AM hour lines are fairly accurate except the earliest hour lines (IV, V) which inconsistently meet the gnomon foot on the wrong side. The PM hour lines seem to mirror the AM lines except that 3 degrees had been added to each, rendering inaccurate time throughout the afternoon. The gnomon is slightly bent, and nearby buildings and trees block the dial at some times of day. The dial is decorated using simple geometric and visually pleasing patterns. Shallow engraving is used for the hour lines (making them a bit difficult to read), labels, and decoration. The gnomon has a bird engraved on each side and sits on a wedge base. The dial sits on a short granite pedestal with a polished top surface, and was commissioned by his parents in memory of Robert Carlyle Howard (born 1953, died 1970). This brass horizontal sundial was designed and engraved for use in the town of Hope BC by British Royal Engineers in 1860. The circular dial is 8 inches diameter with a triangular gnomon. Time lines are engraved at 15 minute intervals from 4 am to 8 pm. The dial is on display in the museum beside other survey instruments and the red uniform of a Royal Engineers Sergeant. A replica 12-inch bronze horizontal dial on a concrete plinth. This dial is a memorial for Marjorie Napier, a twelve-year-old St. Ann's student who died on 31 May, 1922. The original dial and limestone plinth were moved to Queenswood, a private retirement home for elderly nuns and seniors. A plaque for the replica dial reads, "In memory of Una Holm (Robertson) Class of 1928. Thank you the Sisters of St Ann's, the strength of Sister Eleanor Marie and the Rock which was St Ann's Academy. 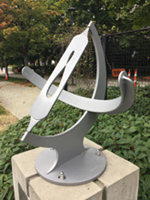 Replica sundial donated by husband Sandy E S A Holm and their daughter Karen Michaelson (Holm) Class of '53." 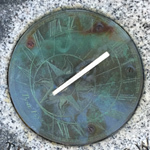 A 30x20-inch vertical dial declining 7° 33' west of south made of granite inset in a stone wall. A memorial dial for Betty Whitlow commissioned by Dean Brian Whitlow. Inscribed, "IN MEMORIAM BETTY WHITLOW, UXOR MATER DELICTISIMUA, MCMXCVI." Information on EOT and longitude corrections are available just inside the south door of the cathedral. A 20 foot overall tinted concrete analemmatic dial with brass numerals, aluminum and granite slabs. Distance between major axis and small hour marks is 16.4 feet. Brass Roman numerals 10 inches high are set in a grey outer ring. Longitude and EOT corrections are marked beside the monthly date marks. A plaque commemorating the British Columbia 150 year celebration includes instructions on use and information on the dial designers and sponsors. Andrei Golovkine, a local designer and community activist conceived, designed and proposed the project to the sponsors. Dr. Dmitry Monin, an astrophysicist at the nearby NRC Herzberg Institute provided the gnomonic design. 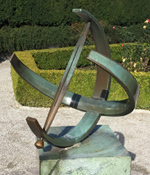 A standard cast bronze sundial, 12 inches in diameter. It shows solar time with Roman numerals from V to VII with noon as XII. Also marked are the half and quarter hours. The hour lines and gnomon angle are correct for the latitude. The gnomon root is in the center of the circular casting in the center of the wind rose showing the cardinal directions. A bronze horizontal dial with hour lines, quarter-hour marks and Roman hour numerals. Dial face includes a central compass rose. The dial sits atop a carved cedar totem depicting an Orca killer whale. 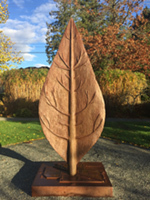 The totem is carved in the Coastal Salish tradition by Aubrey LaFortune, a member of the Cowichan Band of native Canadians. A 12 inch diameter cast bronze horizontal dial with hour lines, quarter-hour marks and Roman hour numerals. Dial face includes a central compass rose with cardinal directions. Dial sits atop a cast concrete pedestal sculptured with curves, fronds and cherubs. Hatley Castle was the stately mansion for the Dunsmuir family, built in 1908 by James Dunsmuir, whose father Robert had built Craigdarroch Castle in downtown Victoria. 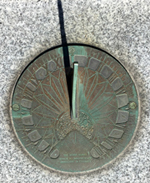 This is one of numerous common-design sundials in Victoria. A 9 inch diameter cast bronze dial with hour and half-hour marks and Roman hour numerals. The dial face has a compass rose at the center with cardinal and ordinal directions. The casting is of poor quality and the gnomon, brazed in place, is bent and at the wrong angle. The sundial is a monument to the Point Hope Shipyard. Engraved on one side is the history of the shipyard, the oldest in British Columbia, renovated and reopened in 2007. The cast dial pedestal is marked, "This newel post was saved from the demolition of St. Mary's Hospital, Victoria. A 12 inch diameter cast bronze horizontal dial with hour lines, quarter-hour marks and Roman hour numerals. Dial face includes a central compass rose with cardinal directions. The dial sits atop a cast decorative concrete pedestal. The dial is correctly designed for the location and is one of at least seven such dials in the Victoria area. A ring equatorial dial built inside a cross-sectioned propane LPG tank. The equatorial surface has an inset plaque that shows EOT corrected time and includes declination lines for date shown by the shadow of the nodus on the polar gnomon wire. Dial sits on a granite block pedestal that shows cardinal directions.